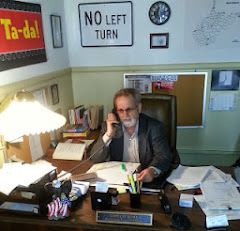 " Larry Kump is none of what most people are in Charleston. He is the first in the Capitol at least 90% of the time (I beat him about once every couple of weeks). He does not go to the functions put on by industry in the evenings. He has an open, but principled mind. The man is not a career politician, and votes the right way when it comes to the US Constitution 99.9% of the time... And that ruffles the feathers of those who believe,from both sides of the isle, that 'we must pass the bill & let someone else determine whether it is constitutional' mentality... And yes, I have heardthat statement from D's and R's, although more so from D's! You can support who you want, but, as for me, Larry Kump is my choice. This is due to his voting record, his principles, his independence, his knowledge of local issues, and his constituent services. Quite frankly, he IS the better choice!" The Contractors Association of West Virginia political action committee (HUB/PAC) has endorsed Delegate Larry D. Kump (District #59, Berkeley-Morgan Counties) in the May 2014 West Virginia Primary Election. Please contact Contractors Association of West Virginia Executive Director Mike Clowser at (304) 342-1166 for further information. Footnote: Please share this message with others, ask them to visit www.LarryKump.com for additional legislative news and views, and send contributions for the re-election of Delegate Kump to "Friends of Larry D. Kump" (P.O. Box 1131, Falling Waters, West Virginia 25419-1131).